It was about one year ago when I first watched a youtube video clip of the Annyeong!Party. I was so thrilled at it and wondered how come K-pop could be enjoyed by people like the Finns living far away from Korea. Now it is time to find out about how the Finnish young people got into the K-pop world and how they enjoy kpop music. Sarangkpop contacted the organizer of the Annyeong!Party and had an interview about the K-pop event. We are an organization first formed in 2004, in Finland, Europe. Our organization first dedicated themselves to promote Japanese rock music in Finland and Europe, by event organizing and such. In 2009 we broadened our specialization to South Korean pop music as well. 2. is the Annyeong!Party about K-pop? 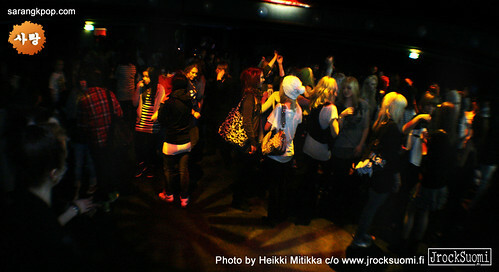 Yes, Annyeong!Party is the only event about k-pop in Finland. It is held for k-pop fans of all ages. 3. what made you to hold the party? Some of our Japanese event attendees asked us, if we could organize some events for k-pop fans as well. 4. when and how did the party start? After we were contacted by k-pop fans we decided to hold a small event for the k-pop fans, and thus the first Annyeong!Party was held the 13th of December in 2009. The first event included dance shows, a k-pop quiz and noraebang with the party event itself. 5. do you hold the party on a regular basis? We try to hold the party atleast twice a year, in 2009 we held one during the end of the year, in 2010 we held one in the winter and one during the summer, for this year we have already held one in February and plan to have two more, during the spring and autumn! 6. how long does it usually take to hold the party each time? The event planning takes a few weeks to prepare, we have to decide if there are competitions, party themes, evaluate the dance crews that will perform, gather staff to hold the events etc. 7. how do you find dance teams to perform at the party? The first dance team R&J that performed at the first event was known by one of our staff members and he introduced the crew to us and we thought they had potential. The second crew 5ive STAR contacted us after the first party, and asked if they can perform as well, giving us material of their progress. We introduced them at Annyeong!Party II. After that we have received a few requests from dance crews, if they can perform at the event. During Annyeong!Party IV, we accepted a third dance crew, the male Azn Boyz Crew, to perform at our event. We have been planning to maybe hold a special dance competition Annyeong!Party, where more dance crews can perform, or maybe have an open audition later on to find more potential dance crews for the future. 8. is there any standard when you pick up the performers for the party? We want to ensure, that the dance crews have basic dancing and performing skills, and we keep up with their practicing processes to ensure that the performances will be successful for them. They also sometimes invite us to their practice sessions or send practice videos so we can view their progress. One standard is that dance performances have to include official k-pop choreographies as much as possible, to ensure the interest of the audience. 9. how many dance teams join the party? The first party was joined by our first crew R&J, the second and the third featured performances of R&J and our second crew 5ive STAR. The recent and fourth Annyeong!Party featured a third crew Azn Boyz Crew, who we have accepted to become a standard performer of our event with the other two crews. We are not planning on growing the amount of dance teams for this year’s events at least. Also a parody dance group held up of Finnish boys Dirty Eyebrows has performed at the second and third party, performing girl group medleys and parody dances made by 2AM & 2PM such as their version of Abracadabra and Hot Issue. 10. how long does the party run? The event has always started at 5PM Finnish standard time, and is held up until midnight or 1AM. 11. how many people come to the party? At the first party we had featured over 200 attendees, the second and third featured almost 400 guests! The fourt Annyeong!Party was a huge success with 700 attendees! But it was also the first time the event was held on a weekend, the previous ones have been held on weekdays. 12. how large is the venue for the party? The venue holds up to 650 guests at a time.